This month-long project has students research and explain the importance of prairie habitats, analyze the impact of human activities on prairies, analyze the socioeconomic impact of humans on communities, and explain relevant prairie issues from multiple perspectives. Students fill out environmental impact statements and other paperwork to experience a real-life issue in a realistic way. There is a student section which contains all the worksheets needed to complete the project, progress sheets, links to relevant resources, and background information. 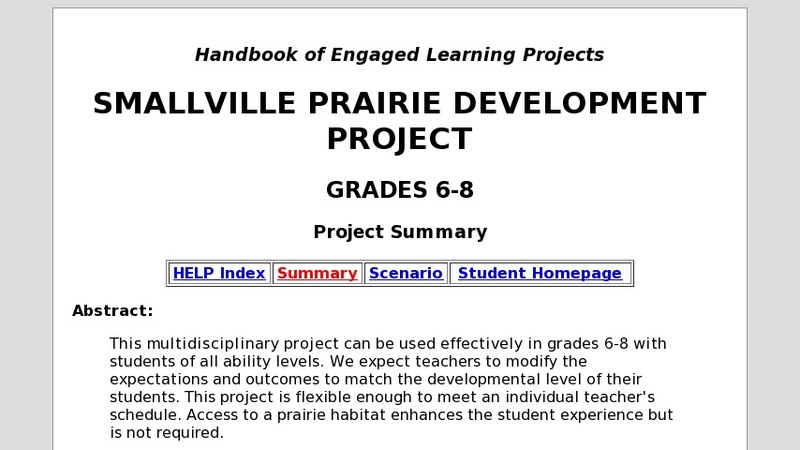 This project was designed by K-12 teachers to demonstrate engaged learning and effective use of technology. It is structured in such a way that students are responsible for their own learning, and is collaborative, student-driven, and technology dependent.